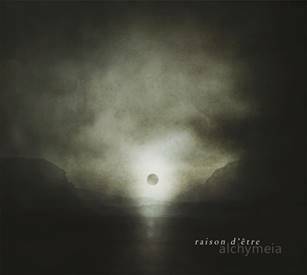 It’s with great honour that Cyclic Law present the latest album by Swedish dark ambient stalwart raison d’être. After the recent collaborative album with TROUM on Transgredient, here now an ALL NEW album – their first ‘regular’ album since 2014’s ‘Mise en Abyme’. This time Peter Andersson scrutinizes the paths of Carl Gustav Jung’s notions of archetypes and the individuation process. Just like ‘Mise en Abyme’, Alchymeia is diving deep down to the shadows of the unconsciousness, and back to a dawn of the true Self. Confronting the shadow within is the darkest time of despair. There seems no way forward, only down. All is blackening and decomposed. Suddenly, through an enantiodromia, the ever deepening descent into the unconscious transmogrifies and becomes gradually illuminated. The melancholia is being purified. Alchymeia is in a sense the “raison d’être” of raison d’être, a shadowy journey through our unconscious the individuation process and archetypes. Limited edition of 500 copies in 6-panel Digisleeve with Matt Lamination!